Heesen Yachts announced that the owner of Project Nova (YN 17850) has appointed Italian designer Cristiano Gatto as interior stylist. Sold in June 2016, Project Nova is the world's first Fast Displacement with hybrid propulsion. 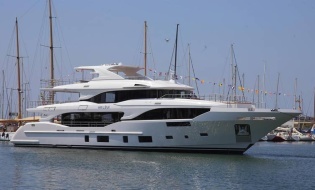 The client, a yacht enthusiast, was attracted by the dynamic exterior design and the impressive performance of this innovative and super quiet superyacht. “The owner asked us to modify colour scheme, design details and overall decoration to give the interior a contemporary, almost minimalist design,” comments Cristiano Gatto, who worked closely with the owner and his team to personalise the interior to match the client's lifestyle. "We stepped in when the outfitting works were at an advanced stage, so we had to work with the existing structures. A two-tone palette has been chosen to give the interiors a bright and relaxing feel. The contrast between the pure white of fabrics, leather and lacquered surfaces and the warm hues of woods, create a sophisticated ambience in all the rooms, bathrooms included. Hints of colour brighten the scheme with deep red or burgundy decorative items, cushions and throws in both the exterior and interior areas to catch the eye and juice things up. The linearity of design is enriched by geometrical patterns, precious materials and meticulously designed details." Project Nova is scheduled to be launched on April 14, 2017, at the Heesen shipyard in Oss.